There are a great number of differing opinions when it comes to discussions of brake improvements so to begin with, I will outline the opinions of PhoenixMotorsport and attempt to justify those opinions. The limiting factor that prevents a car stopping immediately from any speed is the friction between the tyre and the road. So, if your brakes are sufficiently powerful to lock your wheels, (or engage your ABS), then fitting Boeing 747 size brakes to it will not improve stopping distances. If your brakes do not lock when jumped-on…they’re faulty anyway. Fitting harder, uprated pads will almost always increase brake disc wear, reduce braking efficiency at low temperatures and increase brake noise. Brake fade is caused by excessive disc, pad and brake fluid operating temperatures, and is only a problem on brakes being used beyond their design limit, e.g. on the racetrack or continuous, highly enthusiastic driving. Excessive water vapour content in the brake fluid. Change it. Air in the hydraulic system. Bleed it. Incorrect adjustment of drum brakes. Adjust them. Binding or seized calipers or their mountings. Inspect them. Failure of the master cylinder seals. Replace it. Hydraulic system leaks. Check it. Excessive flex in rubber brake hoses. Replace them. Therefore, PhoenixMotorsport does not supply any of the available “Big Brake Kits” which look fantastic with their huge discs and 4/6/8/10 pot calipers and cost a small fortune. And in the vast majority of cases, these kits give the impression of improvements by giving a different “feel” to the brakes, but do not, in fact, improve braking. 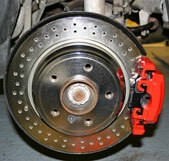 What we do is optimise the stock braking system with a number of available options. We supply drilled discs and pads, braided stainless steel hoses with full stainless fittings and a nylon outer protective coating, and a caliper refurbishing service with a painting, powder coating or plating service. You can have the “Full Monty” or Pick-n-Mix whatever you want. We can, on occasion, fit larger discs and calipers using new Original Equipment parts. Working this way, you the customer can readily acquire replacement parts without being forced to come back to us, (although we hope you will wish to! 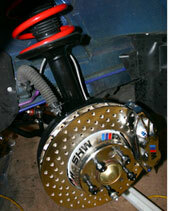 ), for urgently required parts such as brake pads. 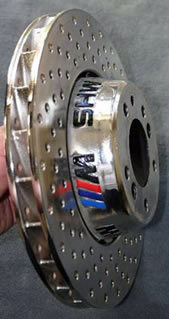 Our discs are almost exclusively manufactured from Italian Brembo blanks. These are then drilled and countersunk for the following improvements. Slotted discs do not have the features mentioned in 1, 2 or 3 (above). We also offer a disc polishing and bright nickel plating service to purchasers of our discs to keep the outer rim and bell very shiny and significantly reduce disc corrosion. In addition, we manufacture “Show Only” discs with more, larger holes and fully polished but these are not for functional use as operation is noisy and the finish VERY temporary. Our brake hoses are manufactured from a Teflon lined hose with a stainless steel outer braid, but unlike many others, come STANDARD with fully stainless steel end fittings AND a nylon outer protective sheath, tinted to the colour of your choice if required.